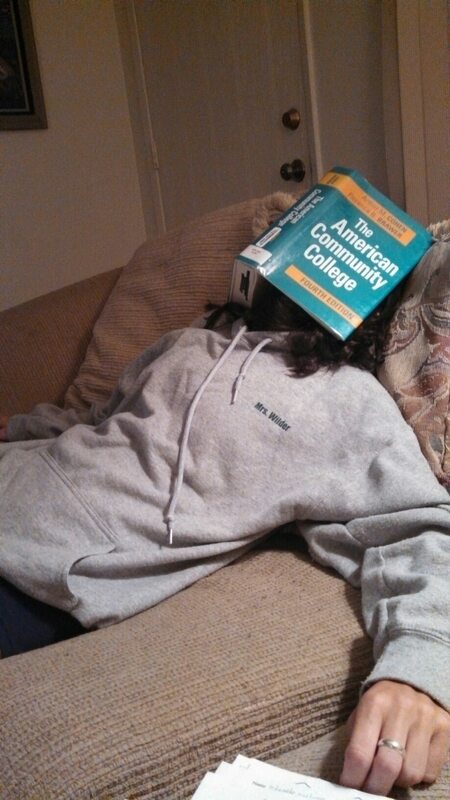 Let’s be honest, the best way to learn about American community colleges is put the book over my tired face and hope that the musty smell of old library book will help my brain absorb all I need. This picture was taken at 8:30…on a Thursday. There is no reason that I should be as tired as I am, and no reason why I couldn’t read the 36 pages assigned for next week. This is my second attempt at doing homework. I spent a good three hours trying to code and synthesize books and journal articles for my research class, and after falling asleep twice in my office chair, I decided it was time to switch gears. The picture is proof of how well that worked. I’m only on page 11 (and I am pretty sure the first chapter started on page 10). This week was hard for me. I’m exhausted. I would love to blame it on the 5 miles I did at the gym yesterday and today, but I know that isn’t the reason. Stress is the reason. For the last year I have been unemployed. School was my only job. I was in Scotland walking everywhere, on a good sleep schedule, and getting enough fresh air to make me almost forget that I wasn’t seeing the sun. Now that I am home, I have something to do or somewhere to be almost every day of the week. Two days a week I am with my Dillybean, two days a week I am working as an AVID tutor, two days a week I do nothing but homework in order to be ready for my Monday study group. I also have the added bonus of a being completely twitterpaited with a boy I can only see on the weekends. All of this is good stress. I love my Dillybean, I love working with AVID, my study group is amazing, and I signed up for the degree, so the homework has to be done. The thing is, the stress hits me extra hard, and wreaks havoc on me. Thanks to my disease, my body goes into shutdown mode to deal with stress. Suddenly everything from focusing on my reading, to walking up stairs, to chewing food is hard for me. My life is very different than it was a year ago. Very very different. To combat this, I am going to spend the weekend in my pjs, doing my reading and research, get some quality time with my yoga mat, and take a lot of naps. Hopefully by Monday I will know a little bit more about American community colleges, and will feel a little less like I’ve been awake for 48 hours. Wish me luck….I’m going to need it.